Unit is 69” square x 247” tall. Unit is rated for 4,000 # product capacity. Low headroom stainless steel Spider-Lift™ bag lift frame with stainless steel debris shield. 4” square x ¼” wall stainless steel structural tube main frame with a 6” square heavy-duty lower base frame. Custom designed frame section includes supports for customer’s existing screw feeder system. 2-ton Harrington chain hoist with motorized trolley and stainless steel hoist rail. 14” diameter stainless steel/UHMW Flo-Lock™ discharge gate for partial bag discharge. 304 stainless steel discharge transition directs material into customer furnished screw feeder. Stainless steel bulk bag support pan with welded tubular supports for operator safety. 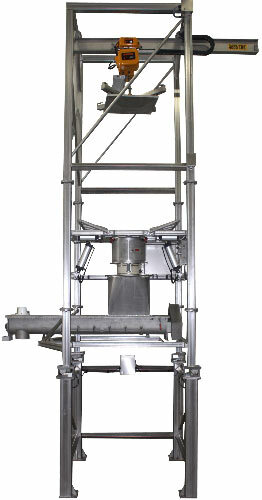 Stainless steel Flo-Master™ bulk bag massaging system promotes positive material flow. Stainless steel Seal-Master™ 18” O.D. bag spout access chamber enables optimal operator access. Stainless steel Sure-Seal™ pneumatic bag spout clamping system seals bag discharge spout to outlet transition for dust-tight discharge. Loss-in-weight load cell package with NEMA 4X summing box. NEMA 4X electrical control enclosure. NEMA 4X regulator and solenoid valve enclosure with window.